Compound NPKs and NPK blends are types of multi-nutrient fertilizers containing some percentage of all three of the major nutrients, nitrogen (N), phosphorous (P) and potassium (K). These products are intended to allow for complete fertilization of a crop with a single application. The raw material sources of each nutrient can vary depending on the production process of the finished NPK fertilizer. When producing compound NPKs, some of the processes used are accretion-style whereby a fertilizer slurry is repeatedly applied to a solid “seed” particle and dried, resulting in an “onion-skin” structure, similar to DAP or MAP production. Other compound NPKs are made via agglomeration-type processes, where the main raw materials are fed as dry solids and then interlocked and cemented by steam, a liquid salt solution, ammonium phosphate slurry and/or an ammonium nitrate solution. But in addition to agglomeration processes which are based largely on physical compaction granulation, there are also processes where liquid phases are achieved through chemical reactions of ammonia with sulfuric, nitric or phosphoric acid, where granulation is done in a rotary drum granulator or a prilling tower. Both of these compound NPK processes result in fertilizers which are homogenous in that each individual particle will have the same N, P and K analysis. In NPK blends, there is a simple bulk mixing of various dry fertilizers such as urea, ammonium sulfate, ammonium nitrate, DAP, MAP and some form of potash to reach an average N, P and K value for the overall blend based on the analysis of the inputs and their ratios in the blend. Ideally, in bulk blends, the inputs will be of similar particle size and structure so that there is a fairly uniform distribution of nutrients. If not, there is the potential for segregation of a given input in the blend which would result in unintended variations to where the N, P and K is distributed on the field when it is eventually applied. Compound NPK producers will usually make production runs of specific analysis NPKs and are somewhat limited in the number of different analysis NPK SKUs they can practically produce and store. Bulk blends, however, are normally produced further down the supply chain, closer to the end-use point, and can be readily customized into an almost unlimited number of NPK variations on relatively short notice. One of the most economical and commonly used nitrogen inputs to NPK fertilizers is urea, but its hygroscopicity and plasticity significantly increases the tendency of urea-based NPK fertilizers to cake in storage. This is intensified when the NPK also includes the most commonly used form of potassium, KCL (muriate of potash). There is also a significant tendency for such products to degrade and generate dust during storage and handling. 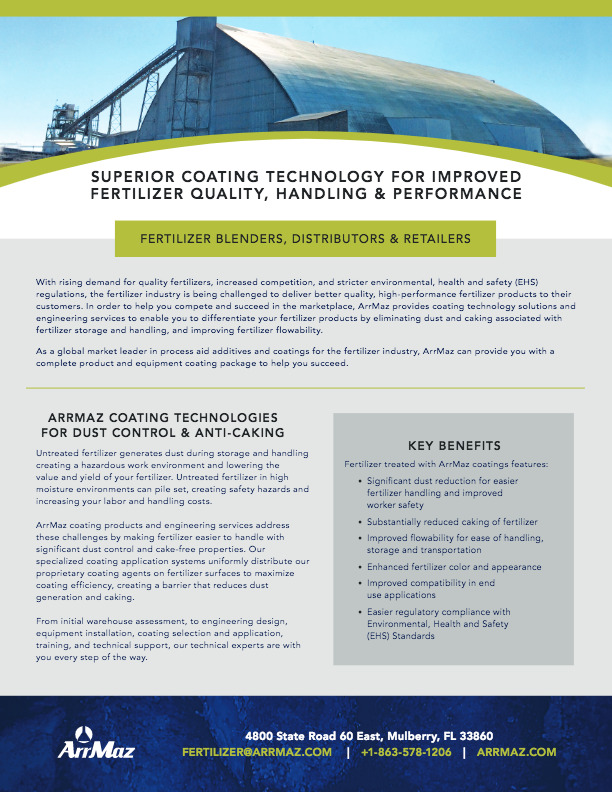 To combat these challenges, conditioning agents such as dust control coatings and anti-caking coatings are widely used at NPK fertilizer production, blending and shipping points. Such treatments sometimes also may be necessary at downstream storage and transfer locations. 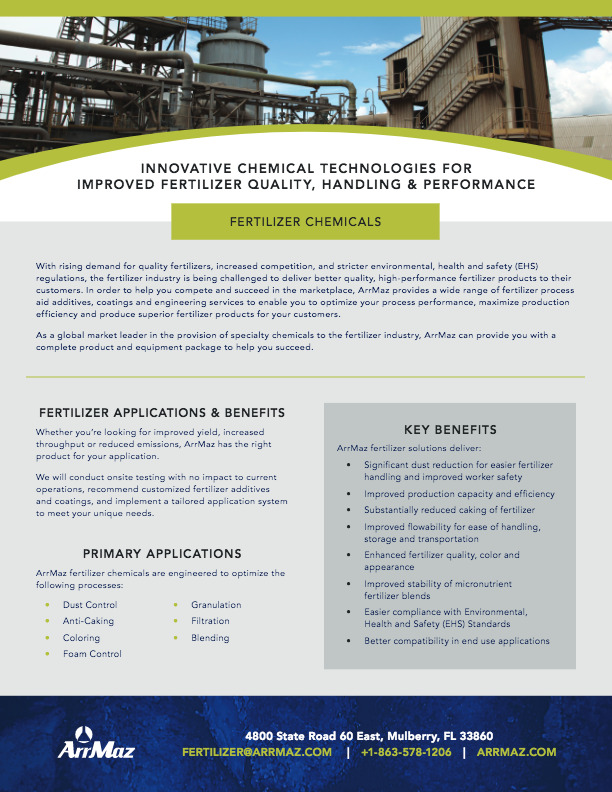 ArrMaz designs and produces coatings which are specifically designed for the treatment of NPK fertilizer, both blended and compounded, and which can be customized to address the individual product and process challenges of producers and users. ArrMaz’s coatings, coloring agents and granulation aids improve the appearance and physical integrity of compound NPK granules, making them stronger and more attrition resistant.